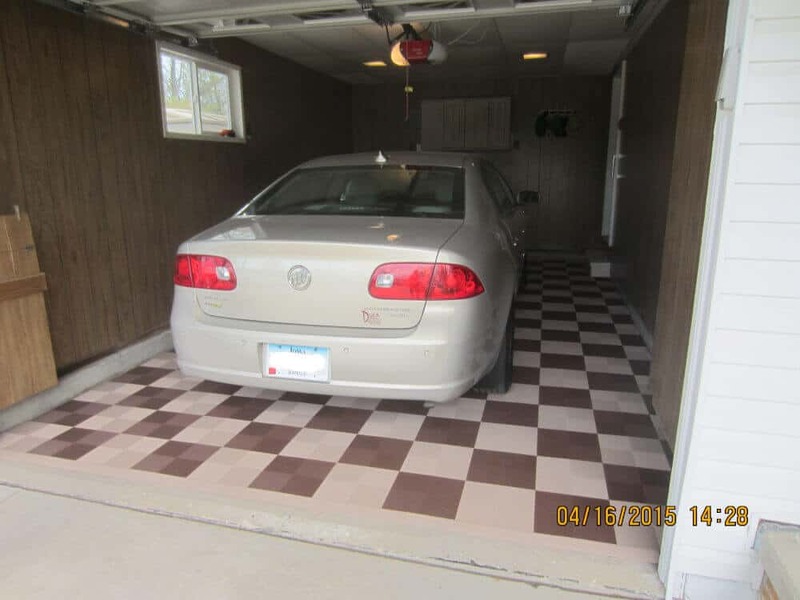 Drain Garage Floor Tiles (aka: perforated tiles) are specially made for your garage floor. They are ideal for areas that will get wet often. These Perforated Garage Floor Tiles (aka Drain Tiles) are specially made for your garage flooring. 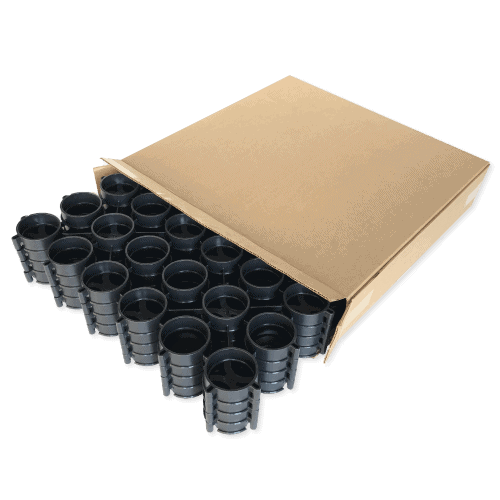 They are designed for maximum water drainage. This is needed in cases where you garage floor gets wet often, or in northern states, where you often pull into the garage with snow on the car. They can be cleaned using a shop vacuum. They are made out of high-impact polypropylene. This is a material that is light-weight but strong enough to withstand heavy vehicles such as Suburbans or Two-Ton Trucks. They are designed to interlock with our other ModuTile 1/2 inch perforated modular garage floor tiles. 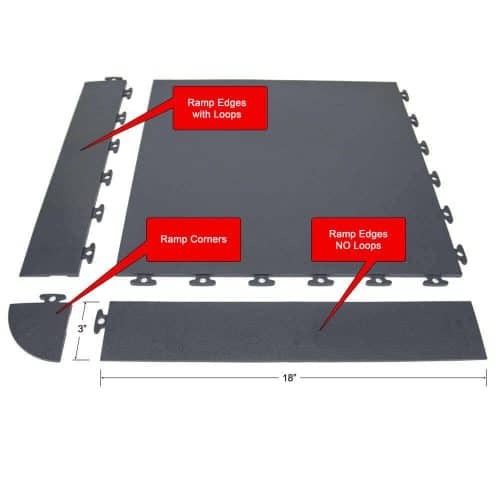 The Perforated (Drain) surface pattern in addition to our textured surface is designed to provide an additional level of safety when walking on them. Please click on the image to the right to view a close-up of the drain garage floor tile. These perforated tiles are made from a high-impact polymer material that is lightweight and strong enough to support heavy rollover loads. Also, the high-impact polymer is difficult to stain. Materials just do not bond well to them, so the tiles are quite resistant to stains. Our specially formulated high-impact polymer is rigid (hard). 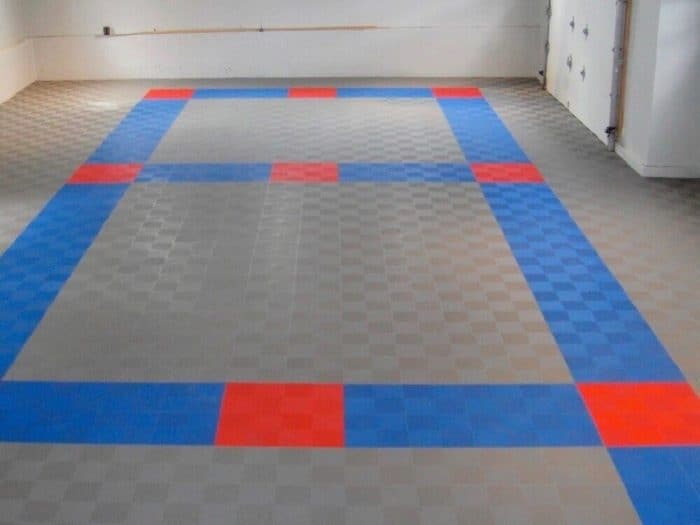 When the floor tiles are interlocked together to form a floor, the result is a robust and solid surface that is strong enough to vehicular traffic. This rigidity is what allows the tiles to be built with a grid underneath for air and water circulation. One added benefit is that if the concrete in the garage has cracks or imperfections, the floor that is formed on top after the tiles are installed looks perfectly even. 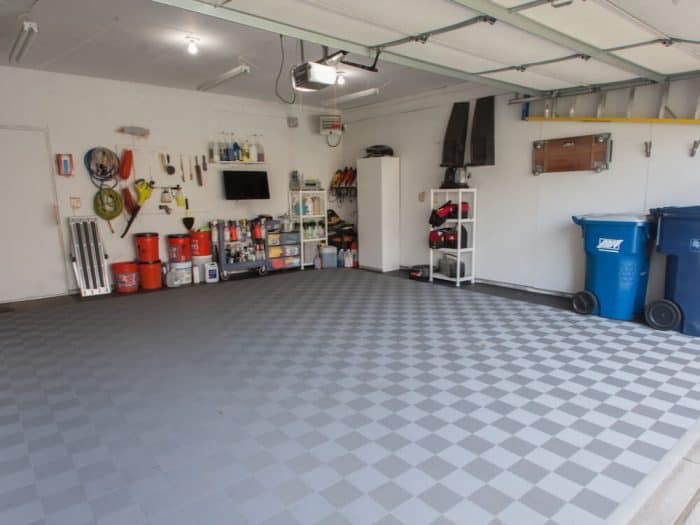 In other words, it effectively covers an ugly and imperfect garage floor. The perforated garage floor tiles have a mesh or drain top surface and a grid structure underneath. This structure makes an air gap between the concrete and the top surface of the tile. The most significant benefit of the grid structure is that it allows moisture to escape from underneath. It also provides an air gap separation between the concrete underneath and the top surface. 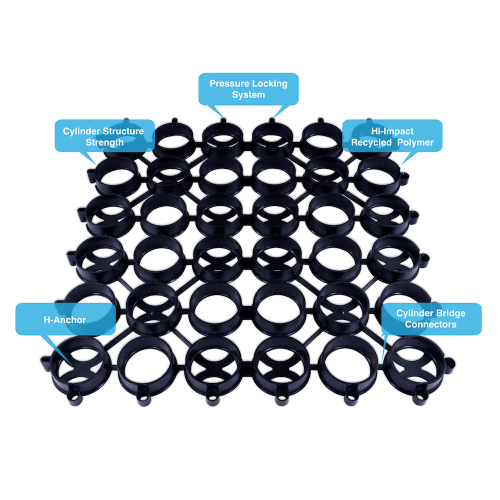 For ease of installation, the four loop-to-peg interlocking system snaps together without the need for tools. Two sides of the tiles have loops and the other two sides have pegs. 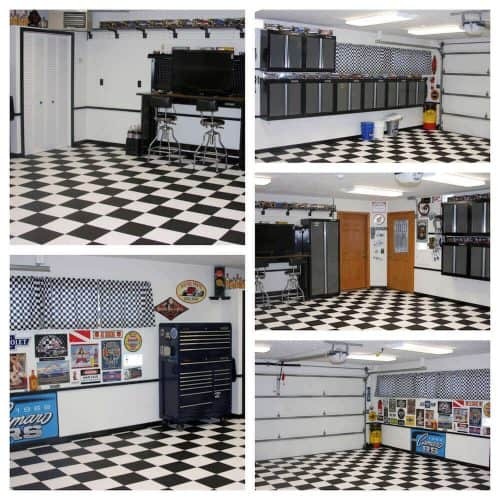 They interlock like puzzle pieces to form any size garage floor. When installing a large area, you may consider using a small rubber mallet and knee pads. Please download our garage floor tiles installation guide for a more detailed explanation. Our Perforated (Drain) interlocking floor tiles are designed for residential garages. The tiles can easily support the heavy load of large vehicles such as SUVs or large trucks. They will also support tool chests, garage cabinets, refrigerators, pool tables and much more. Please note that pinpoint weights may damage the tiles. They do not usually break, it but such pressure may cause discoloration. When using a jack or other sharp heavy objects, we recommend the use of plywood or another protective flat rigid surface above the tiles. For permanent vehicle lifts, we cut the tile around the lift. 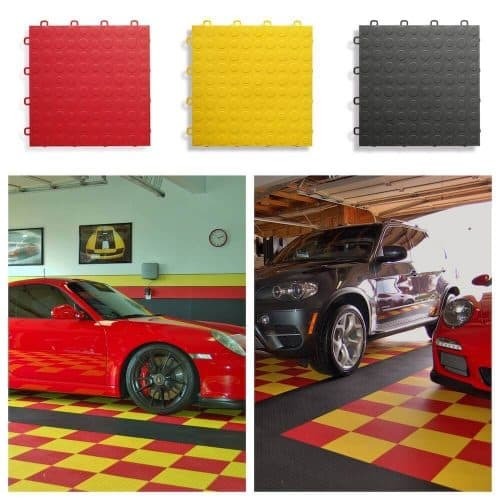 The perforated garage floor tiles are resistant to grease, hydraulic fluids, salt, and oil. We have found that acids will damage the surface of the tile. One typical example is battery acids from golf carts. When creating a golf cart parking area, we recommend placing a protective mat directly below the battery. 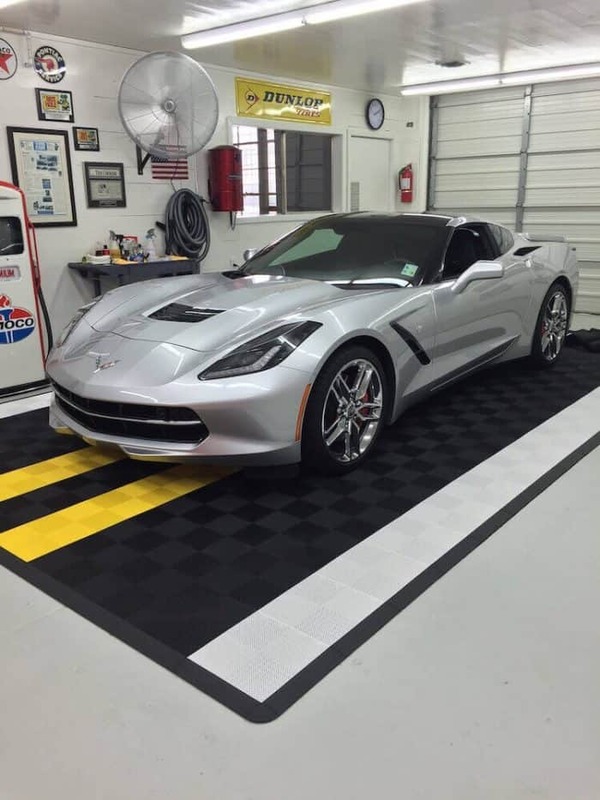 Install your next garage floor project quickly and effortlessly with our Perforated Garage Floor Tiles. Buy them today! Just add them to the cart and proceed to the checkout page. Follow the link to learn more about ModuTile Interlocking Garage Floor Tiles. As always, if you have any questions, please feel free to call us at 713-663-6060 message us via our Contact Us page. Thank you, good product, all my tiles boxes arrived earlier than expected. I ordered 347 squares of your black interlocking perforated floor tiles on 8/28/13 I initially thought it would take 6-10 business days for the shipment to arrive, but to my surprise it arrived at noon on 8/30 amazing and the shipping was free. Now for the product itself, I.e., absolutely amazing how simple it is to install. These tiles are replacing outdoor carpet I had on a bottom area (cement) below our upper deck which the carpet only lasted a couple of years (mold and fading) do to lack of direct sunlight and rain and the humid conditions we get here in Georgia. The tiles look awesome and again a piece of cake to install. I can only thank you very much for your great product… Each and everyone at ModuTile should be congratulated on your organizations achievement… I.e., from the ease of use web site for ordering, the rapid shipping area along with the perfect fulfillment of my order, the quality of the product, etc., etc., Bottom line, One outstanding U.S. based company! I placed this order on Monday afternoon and made a mistake on the color. They took care of it immediately, my tiles were shipped on Tuesday and I received them today, Wednesday. Excellent service! I will highly recommend ModuTile to my friends. The tiles were well received and the floor came out amazing!!! Thank you!! As a automotive detailer, I am frequently working on a wet floor after washing a car. I don’t rush, but I do hustle and a wet floor can be treacherous when you are focussed on the vehicle. I was interested in a flooring option that would minimize the risk of a slip/fall and also let me work in a dry environment while attending to the lowest portions of a vehicle. I did a lot of research before purchasing the draintiles. I found that many similar products would still be slippery when wet based on other user’s experience. I believe this is due to the smooth tops of the tiles. One unique feature with modutile is small ‘nubs’ perpendicular to the main slats. These nubs contribute to better traction and was the primary reason I chose modutile over other brands. The tiles were very easy to install with a rubber mallet. The tiles cut very easily with a table saw and fine toothed blade. 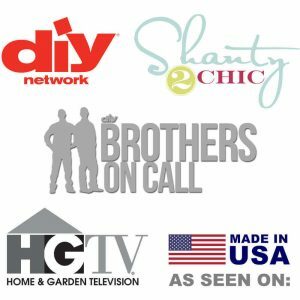 I was able to install 500 square feet in approximately 3 hours, including moving all the equipment in my work space and making all the cuts for walls and corners. After working on them for a while, I am very pleased with their performance. Water flows through easily and I have a relatively dry working surface. I have not experience any issues with loss of traction when my shoes are wet. They stay clean for quite a while and clean up very easily. I have not had any issues with them crushing under ramps. I am aware that floor jacks and jackstands can damage them, but removing a few tiles prior to any wheels-off details takes only minutes. Overall, I am very pleased with my choice of tiles and will continue to recommend them. Just got the shipment yesterday and installed the tile in the garage today. It took around 5 hours to tile a 12 x 22 garage. 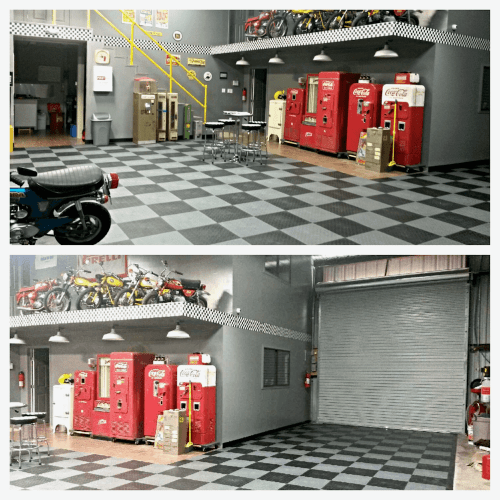 It was really easy and made the garage look great! Thanks so much for the help online and for a great product. So pleased with the product and ease of installation. I recently completed two projects using ModuTile products. 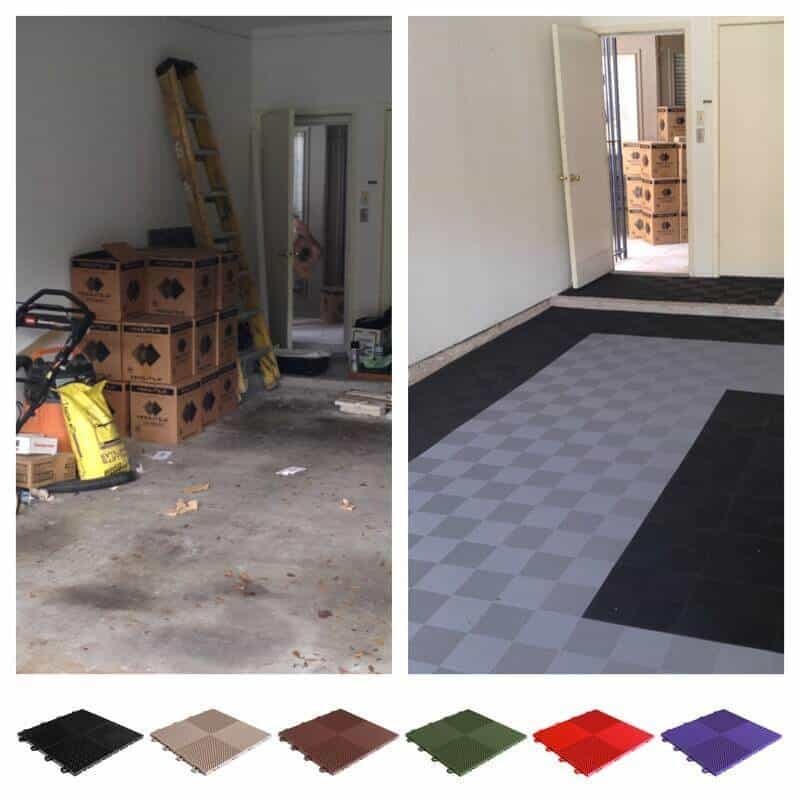 The first was a Golf cart parking mat using black coin top tiles and this past week installing perforated black and grey tiles in the main garage. I must say the product is as good as advertised and quite easy to install. The perforated tiles really transform the garage into a showroom. My old floor was stained and still in pretty good shape, but I got tired of re-doing it every few years and cleaning. Putting in ModuTiles really made a big difference, and all the neighbors just say wow. I will be recommending your product to everyone. Thanks for the great product, service and fast shipping. The flooring looks great! I have used race deck in the past but liked the style and price of your tile better…it was shipped quick to us. very easy to install and cut. It definitely makes a huge improvement in the garage! They look great and were easy to install. 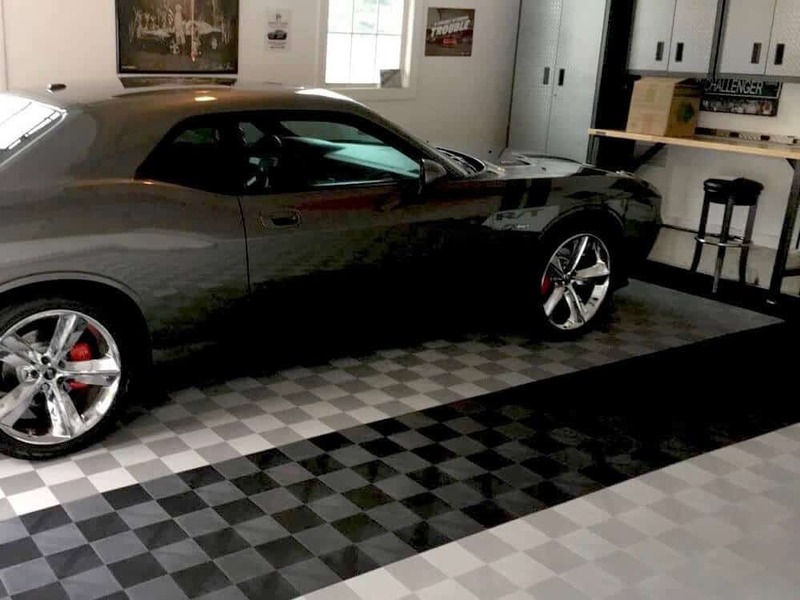 From the color to the style, I love everything about my new garage floor. I used 6 cases of beige and very happy with quality of this product. Already Recommended family and friends. I picked Modutile over RaceDeck and Swisstrax Floor tiles versions since Modutile manufacture these tiles as good as them and much much cheaper with same or better quality. This product is very easy to install and easy to cut. 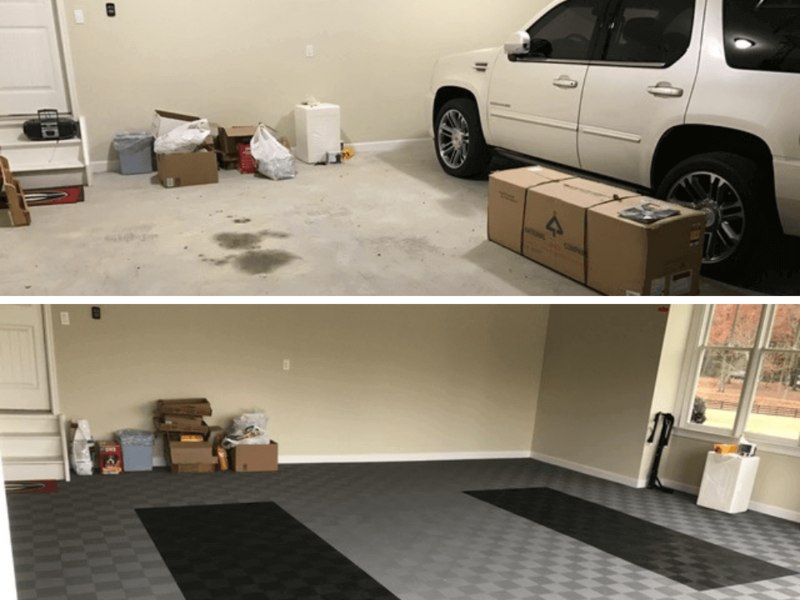 The price was right and the amount of product supplied was sufficient.My two car garage took couple hours.I found this product to perform completely great and i would definitely recommend anyone to use this product. Will send you a picture when I get it all finished, not anything unusual but it sure looks a lot nicer than concrete, and easy to install. We purchased so many of beige colors after seeing our next door neighbors deck. i can recommend this product to anyone. great price,great service and most important made in the US of A.